End the day at 5:00pm PT with CNET’s Women In Tech panel, featuring Marissa Mayer, VP of product management, in LVCC South Hall, Upper Level Lobby – CNET Stage. 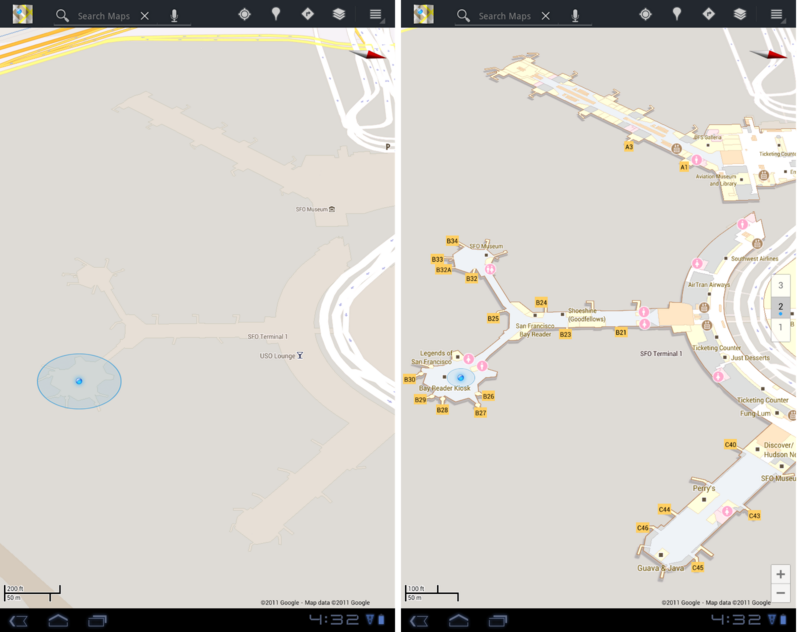 When you’re inside an airport, shopping mall or retail store, a common way to figure out where you are is to look for a freestanding map directory or ask an employee for help. 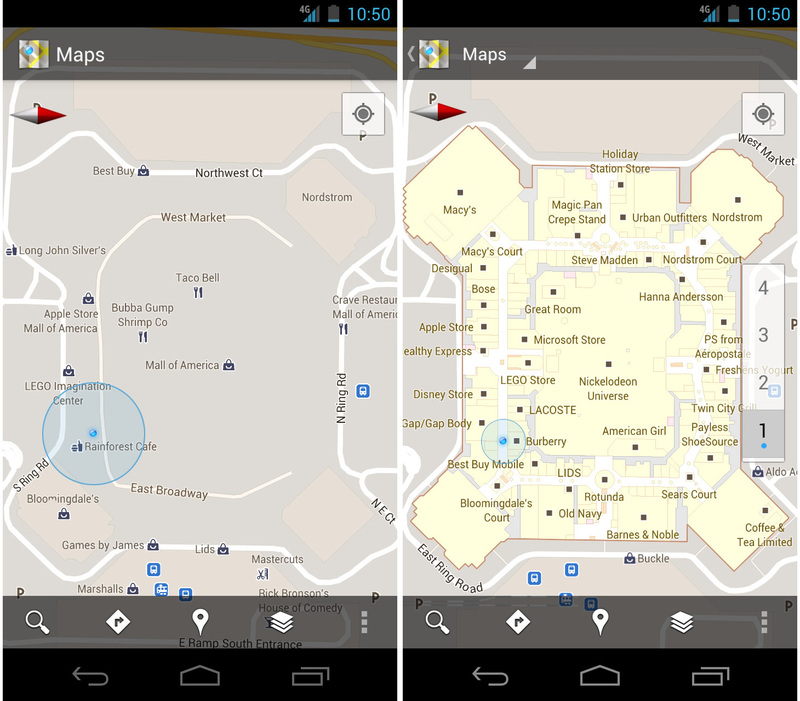 Starting today, with the release of Google Maps 6.0 for Android, that directory is brought to the palm of your hands, helping you determine where you are, what floor you’re on, and where to go indoors. Mall of America, IKEA, The Home Depot, select Macy’s and Bloomingdale’s, Daimaru, Taskashimaya and Mitsukoshi locations and more. Watch an IKEA demo here. For a detailed list of participating locations, please visit our help center. 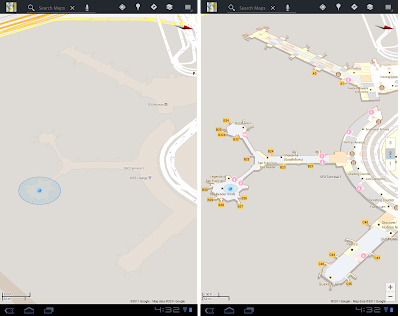 And this is just the start–we’ll continually add new indoor maps to public buildings across the world. If you’re a business owner interested in getting your location’s floor plan included in Google Maps, visit maps.google.com/floorplans. You’re now one step closer to experiencing and interacting with a 3D mirror of the real world within your browser with Google MapsGL. Google MapsGL takes Google Maps and harnesses the power of Web Graphics Library (WebGL) to create far richer visuals and animations. WebGL is a new technology that brings hardware-accelerated 3D graphics to the browser without additional installed software. With WebGL your maps experience is much better with 3D buildings, smoother transitions between imagery and the ability to instantly “swoop” into Street View without a plugin. Starting today, if you’re using supported browsers (such as Chrome 14+ or Firefox Beta) with compatible video cards, you can opt in to the early beta release. 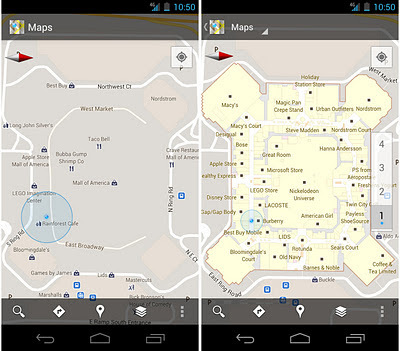 Visit maps.google.com and click “Try it now,” or visit maps.google.com/gl to learn more. We’ve been using WebGL to create experiences like our Chrome experiments “3 Dreams of Black” and “All is Not Lost,” which happen right in the browser. Previously, such sophisticated 3D graphics have only been possible on traditional desktop applications and have required manual installation. WebGL ushers in a whole new generation of graphics on the web, and with that, we can begin to redefine the expectations of an online map. Check out Chrome Experiments WebGL for more WebGL-powered applications, and opt in to Google MapsGL to begin using the next generation of mapping today. “Did you know there’s a place in Menlo Park near the Safeway that has a 27 food rating?” one of my friends asked me that about two years ago, and I was struck because I immediately knew what it meant. Food rating… 30 point scale… Zagat. And the place… had to be good. With no other context, I instantly recognized and trusted Zagat’s review and recommendation. So, today, I’m thrilled that Google has acquired Zagat. Moving forward, Zagat will be a cornerstone of our local offering—delighting people with their impressive array of reviews, ratings and insights, while enabling people everywhere to find extraordinary (and ordinary) experiences around the corner and around the world. With Zagat, we gain a world-class team that has more experience in consumer based-surveys, recommendations and reviews than anyone else in the industry. Founded by Tim and Nina Zagat more than 32 years ago, Zagat has established a trusted and well-loved brand the world over, operating in 13 categories and more than 100 cities. The Zagats have demonstrated their ability to innovate and to do so with tremendous insight. Their surveys may be one of the earliest forms of UGC (user-generated content)—gathering restaurant recommendations from friends, computing and distributing ratings before the Internet as we know it today even existed. Their iconic pocket-sized guides with paragraphs summarizing and “snippeting” sentiment were “mobile” before “mobile” involved electronics. Today, Zagat provides people with a democratized, authentic and comprehensive view of where to eat, drink, stay, shop and play worldwide based on millions of reviews and ratings.